WTH?! (What the Heck?) Moments are attempts to find the memorable and the off-beat perspective on Longhorns sports. Here are some interesting moments from the Texas’ Men’s Basketball Season. Rick Barnes' Texas basketball team collapsed midseason. Pre-Season WTH Mr. April?! April is the month when most high school basketball players sign their letters of intent. Coach Rick Barnes, Mr. April, has out did himself by coming up with an incredible freshman class that includes McDonald All-American Avery Bradley (6-2, 180), Jordan Hamilton (6-7, 226) and J’Covan Brown (6-1, 185) to go along with highly touted transfer Jai Lucas(5-10, 150). These additions with three seniors Damion James (6-7, 225), Justin Mason (6-2, 195) and Dexter Pittman (6-10, 290) had this team starting the preseason ranked #3. An ESPN article reported that Barnes would rather develop players for the NBA than win an NCAA championship. I believe this is a misinterpretation because Mack Brown finally shed his stigma as Mr. February with his national championship, let’s hope that Coach Barnes does the same soon. Nov. 25th WTH Practice?! The season was starting fast with a win over highly ranked Pittsburgh 78-62, but during pregame warm-ups Varez Ward right knee gave out ending his season. “We not talkin’ bout a game – we talkin’ bout practice” nod to AI. Who knew his backcourt experience (only as sophomore) would be sorely needed throughout the year? Dec. 22nd WTH DJ?! Damion James was making claims early in the season for player of the year honors with back to back 20+ points and 13+ rebound in wins over #10 North Carolina (103-90) & #9 Michigan State (79-68). DJ also established himself as UT’s all time leading rebounder by surpassing James Thomas. The problems of poor foul shooting and any lack of a half court game was covered up by the Horns posting 17 straight wins through mid-January. Follow along live with 40 Acres Sports on Twitter and below for our thoughts and analysis during today’s Texas game versus [tag]Baylor[/tag] on the Big 12 Network. We’ll be live right around tip so join us to discuss the game at 3:00pm Saturday. Feel free to leave comments and questions using the live tool, but not all comments will be published. Read below for more notes on comments and how the live blog will work. Hook ’em! Follow along live with 40 Acres Sports on Twitter and below for our thoughts and analysis during tonight’s conference basketball match-up on ESPNU. We’ll be live right around tipoff for Texas versus [tag]Texas Tech[/tag] so join us to discuss the game at 8:00pm Wednesday night. Follow along live with 40 Acres Sports on Twitter and below for our thoughts and analysis during today’s big hoops match-up on CBS. We’ll be live right around tipoff for Texas versus [tag]Connecticut[/tag] so join us to discuss the game at 3:00pm Saturday afternoon. A few missed free throws, a couple of missed rebounds, at least two awful foul calls and Texas’ 2009 basketball season came to an end. After a good showing and victory over [tag]Minnesota[/tag], Texas faced [tag]Duke[/tag] in the second round. Duke has owned Texas since [tag]Rick Barnes[/tag] has been on campus winning games by over 20 points three times. On Saturday night in the second round of March Madness Texas at least made a game of it. [tag]Dexter Pittman[/tag] continued to be unstoppable in the paint. In tournament play (Big 12 and NCAA) Big Dex has taken his game to another level. Big guys that demand the paint are a dying breed in basketball, especially at the college level, and with one year left in college the Texas staff and fans should be excited about the return of what could be the most dominate low post presence in the nation next year. Another bright spot in the first two rounds of the tournament was the play of freshman point guard [tag]Varez Ward[/tag]. Texas has struggled at the point guard position all year, mostly because all of their players who have the ball handling skills to play the 1 do not possess the scoring skills to make opposing defense’s respect them on the perimeter. Ward does not have a great shot, but unlike [tag]Dogus Balbay[/tag], Ward isn’t afraid to shoot it on occasion. Ward may have replaced [tag]Justin Mason[/tag] as the best on ball perimeter defender on the team, and he attacks the basket and makes good decisions. With the loss of [tag]AJ Abrams[/tag] to eligibility Ward will be huge even with the talented freshman class coming in. Speaking of Abrams, the Texas fan base will have no idea how much he meant to this team until he is no longer on campus. There have been message board rumblings that Texas would be better off without the sharp shooter from McNeil high school. All Abrams was for Texas was the best perimeter shooter in school history. It is amazing that on a team that struggled to score so much for most of the season that the one guy who could score at will was taken for granted so much. When AJ was making shots this team could beat anyone in the nation, when the other Longhorns on the floor were so inept that opposing defenses could shadow Abrams every time down the floor and he was taken out of games, Texas would go long stretches with no points. Thank you AJ. I needed to say that. It was an on and off season for [tag]Damion James[/tag] and [tag]Gary Johnson[/tag] and the two rounds of the NCAA tournament was a perfect microcosm of their season. James was Jekyll and Hyde, sometimes in the same possession, so much so that there is talk around campus that he may come back for his senior season. It was expected all year that James was a sure fire lottery pick because of the lack of top flight talent in this draft class. However, James hasn’t adjusted the perimeter game as easy as some thought, and he may need another year to prove he can be a small forward. Johnson on the other hand struggled down the stretch. In the mid part of the season it looked like the former Mr. Texas would emerge as the number three scoring option for this team. Instead, the sophomore fell in love with his mid range jump shot. It will be important for this team to get Johnson’s aggressiveness up in the offseason. A front court of Pittman, Johnson, and prep star [tag]Jordan Hamilton[/tag] could be the best in the nation if Johnson can demand attention at the power forward position. He isn’t as good of a rebounder as he should be, and that should be a number one priority in the off season. In the end the game was lost because of free throw shooting. Texas had every opportunity to win the game against Duke, and while some will blame the referees and some will blame the coaches, it really came down to wasting points at the charity stripe. Coming into the season many felt it would be this team’s Achilles heel, and in the end it was. The Longhorns performed well though, in a game most gave them no chance of winning. Most fans will look at this season as a disappointment, but the 2009 team went further than Kevin Durant’s squad did. People must remember that this team and offense was built for a scoring point guard to dominate the ball and set up the other talent on the floor. That plan went out the window when [tag]DJ Augustin[/tag] went to the NBA after his sophomore season. This is the same team, minus Augustin, that went to the Elite 8 and was given a two seed in the tournament. College basketball is a guard dominated game. A point guard dominated game. Texas came up short on that all year, and they weren’t good enough at three point shooting and/or rebounding and defense to make up for their personnel deficiencies. Follow along below with our live thoughts and analysis during tonight’s opening round game versus [tag]Minnesota[/tag] on CBS. We’re live now, join us below. We’ll also be embedding Twitter posts from @40AcresSports and with the hashtag #UT right in with the other notes. Feel free to leave comments and questions using the live tool, but not all comments will be published. Read below for more notes on comments and how the live blog will work. Hook ’em! Text only archives available here. Harrison Smith had a career night, but it came due to massive struggles from Justin Mason & Varez Ward. Stop if you’ve heard it before, the Texas basketball team is struggling. The Longhorns followed their huge home victory up with a close and ugly win over [tag]Texas Tech[/tag] and then a loss in Stillwater to [tag]Oklahoma State[/tag]. In both games Texas was sloppy on the offensive end. Texas’ main problem is their personnel combinations. The whole season hinged on [tag]Justin Mason[/tag] and/or [tag]AJ Abrams[/tag] being able to play the point consistently. Both were given chances and both failed. That inability forced another point guard into the starting lineup. And that is Rick Barnes’ dilemma, do you move [tag]Damion James[/tag] to the four and play the small guards and a big like last year’s team or do you bring Mason, your best perimeter defender, off the bench to keep James at the three with two big men. The answer so far has been James to the four. The decision has brought mixed results, but I don’t think Barnes likes the decision. All offseason Barnes stressed getting bigger in the back court. Playing Mason at the three makes Texas one of the smallest perimeter teams in the country. But what choice does he have? [tag]Gary Johnson[/tag] is hurt. [tag]Alexis Wangmene[/tag] is hurt. [tag]Connor Atchley[/tag] has been sacked. [tag]Dexter Pittman[/tag] can’t play over 20 minutes per game. And I’m not sure [tag]Matt Hill[/tag] still can play without his hair. Barnes has put more faith in [tag]Clint Chapman[/tag] as of late, but the sophomore is nothing more than a role player with some offensive upside at this point. The fact is the Longhorns hands, or hooves, are tied. This is last year’s team without a superstar point guard who can shoot from the outside. For all intents and purposes that is like saying the Bulls were the same team when MJ was trying to hit curveballs in the minor leagues. Barnes’ team has two conference games left ([tag]Kansas[/tag] and [tag]Baylor[/tag]) before the conference tournament. As long as Texas splits those games and wins their opening round tournament game they’ll get into March Madness. Luckily Texas won some early games against big name opponents and Blake Griffin can’t handle contact or NIT would have been what this team had for supper. There aren’t any great teams in college basketball. North Carolina, Connecticut, Duke, [tag]Oklahoma[/tag], and everyone else have shown the ability to drop a game they should win. That fact gives Texas hope if they can hang in there and get to the tournament. The Longhorns could be a bracket buster this year. What a difference a week makes? Last week at this time the fans on the 40 Acres were left scratching their heads wondering out loud if their Texas Longhorns were really going to end up in the NIT. One week later on the back of [tag]AJ Abrams[/tag] scoring ability and the inability of player of the year candidate Blake Griffin to take a hit the Longhorns are right back in the thick of things after a win over [tag]Oklahoma[/tag]. The team now holds wins over Oklahoma, [tag]UCLA[/tag], [tag]Villanova[/tag], and [tag]Wisconsin[/tag]. Out of their eight losses only the [tag]Arkansas[/tag] and [tag]Kansas State[/tag] losses can be considered bad. The style of play Texas uses makes every game a dog fight. The style is a double edged sword. Every game being close makes teams vulnerable to lesser teams who are hot down the stretch of a ball game, i.e. Kansas State. The style also keeps a team in a game they probably shouldn’t be in, i.e. Oklahoma. Texas’ back yard mentality stifled the Sooners in the first half while Griffin dealt with foul trouble and a glass chin. The Longhorns made a run to push out the lead, but anyone who has watched this team play all season knew Oklahoma would make a run. In fact, the Sooners made two double digit to zero runs in the second half as the Longhorns struggled to score when Abrams was being guarded and forwards [tag]Damion James[/tag] and [tag]Gary Johnson[/tag] struggled with their mid-range game. Texas has been prone to long dry spells offensively all year because of inconsistent point guard play. The major bright spot, besides the win itself, on Saturday night has to be the emergence of [tag]Dogus Balbay[/tag] as the true starting point guard. The move makes this team the same as last year’s with the trade at the one guard Balbay for [tag]DJ Augustin[/tag]. While the trade is nowhere near even, it does allow [tag]Justin Mason[/tag] to stay on the floor and concentrate on defense and clean ups instead of running the show and more importantly it puts James back at power forward where he can slash to the bucket and be a monster on offensive rebounds. Balbay has the ability to penetrate the lane and either finish with his underrated athleticism or find a shooter in the corner. Abrams can shoot from anywhere at any time, but the other Texas shooters like James, Mason and [tag]Connor Atchley[/tag] enjoy success when they catch and shoot. The ease in which their shot came off of drive and kick plays has been missing all season. When Abrams was the point guard the offensive relied on isolation and pick and rolls, when Mason was the point guard he had the ability to get to the bucket but only to get himself points, but now that Balbay is the man at the point the whole Texas offense has opened up. 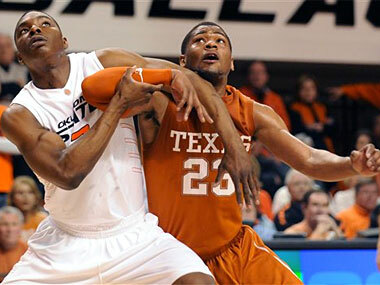 Another positive that came from beating the Sooners was the play of [tag]Dexter Pittman[/tag]. The big guy dominated the paint even when Griffin was still healthy and fresh. He also made the key rebound and bucket of the game following an Abrams miss with less than 15 seconds left in the second half. Saying Atchley is struggling on par with our economy. 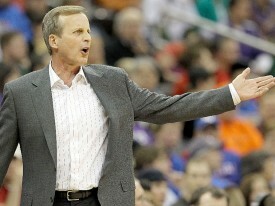 And just like the guys in Washington it looks like head coach [tag]Rick Barnes[/tag] is at a loss on what to do. Barnes has started him, brought him off the bench, played him inside, and even tried playing him at the small forward for stretches. Atchley played decent against Oklahoma but he is not the threat he once was. There was a time some were calling him the best pro prospect on the roster this year. Not anymore. Pittman received the start because of the matchup with Griffin, but after his strong play with Griffin out of the game don’t be surprised to see Atchley coming off the bench for the rest of the season. If Pittman does get the start it will mean Atchley would be the second big man to come off the bench after Gary Johnson. Right now Johnson and Pittman do more for this team, and while I’m sure it is hard for Barnes to sit a senior who has given so much for the program Barnes still has to do what is best for the program. At this time that may be taking away significant minutes from Atchley. While the win has many guaranteeing a tournament berth for the Longhorns, Texas still has work left to do. They have three winnable games against [tag]Texas Tech[/tag], [tag]Oklahoma State[/tag], and [tag]Baylor[/tag] before finishing up in [tag]Kansas[/tag] against the Jayhawks before the Big 12 Tournament. If Texas can go three of four in that time they’d finish at 10-6 in conference. That gets Texas in no matter what happens in the tournament because believe it or not the nation respects the Longhorn basketball program more than the fans and students do. For the first time in the [tag]Rick Barnes[/tag] era the University of Texas basketball team is in real danger of not making the NCAA tournament. This could be the most any of the major three programs (football, basketball, baseball) has struggled in the regular season since their respective coaches arrived on the Forty Acres. Rick Barnes is an amazing coach, but sometimes the players just aren’t there. For the 2009 UT basketball team that player is [tag]DJ Augustin[/tag]. Last year Augustin was recognized as the best point guard in the nation. He decided to leave after his sophomore year for the NBA, a move that has worked out for everybody but the Longhorns. Texas has been spoiled in the backcourt in recent memory. The stellar play started with [tag]TJ Ford[/tag], next came [tag]Daniel Gibson[/tag], and then Augustin. Right now they’re stuck with Justin Mason who can’t score, [tag]AJ Abrams[/tag] who can’t dribble or pass, and [tag]Dogus Balbay[/tag] who can’t shoot and struggles with consistency. Every key member from last year’s Elite 8 team returned besides Augustin. Last year at this time Texas was playing for a number one seed and the talk around town was of national championships. This year the Longhorns are coming off four losses in their last six games, none to a top 10 team, and the talk is centered around if the team will even get to be a part of March Madness. There is still talk of national championships on campus, but the sport is football. Texas went through something similar following their Final Four berth when the then sophomore Ford decided to skip his last two years of college for the NBA. Barnes had his whole team coming back then too, but the group led by Brandon Mouton, Royal Ivey, and James Thomas at least made it to the tourney. On the message boards, at the water cooler, and on the couch most fans are looking for someone to blame. Has Barnes forgotten how to coach? Did the players regress that much? Who kidnapped [tag]Connor Atchley[/tag]? The answers aren’t that simple. Or maybe they are. We’ve all heard the expression, “It isn’t the X’s and O’s it’s the Jane’s and the Joe’s.” The 2009 version of Texas basketball has proved the old saying to be right. The Longhorn offense is set up for a player to dominate the ball and create for teammates who are coming off screens. Texas has the players to come off the screens but they don’t have the guy to get them the ball at the right time in the right spot. On top of that Barnes likes to have a guard who can shoot and score off the dribble. Texas has guards who can shoot and they have guards who can score off the dribble, but they don’t have any who can do both. This allows defenses to play a box and one, trailing Abrams, and making other people beat them. So far Texas hasn’t done it enough. It is hard to imagine this same team beating UCLA and Villanova, but they did. And that fact leaves some hope, but with [tag]Kansas[/tag] and [tag]Oklahoma[/tag] still on the schedule it looks like a .500 finish may be in sight. With the Big 12 in a perceived down year, that just won’t cut it. It is looking more and more likely that the Longhorn fate will be decided in the Big 12 tournament. And this year it has nothing to do with seeding. It will have to do with the bubble. A word Texas hasn’t had to worry about in a decade. The good news is the cavalry is coming. Texas has a top three recruiting class coming in and they all can score. Just another reason to wish for next fall to get here. The Texas Longhorns men’s basketball team went from a top ten ranking to possible on the outside looking in for the NCAA Tournament. Saturday the team dropped its third in a row to [tag]Nebraska[/tag] to fall to 6th place in the Big 12 thanks to a 4-4 conference record. This may have been one of the most disappointing games of the seasons as at the end of the first half and beginning of the second they played some of their basketball in weeks. In the end it was another hectic finish and just like in previous games the Horns couldn’t get it done. [tag]AJ Abrams[/tag] and [tag]Justin Mason[/tag] both had looks in the last moments but neither made the shot and Texas fell 55-58.